What companies choose to sponsor says something about the company’s culture and ambition. Do they focus on sport or arts? Do they go for global events – football, olympics, Formula 1, or choose local events? In another job I was involved in the assessment of a sports sponsorship, by the time we listed what was available, and eliminated options that were occupied by direct competitors the choice was between three. I think at the global level the decisions are pragmatic and connected to the desired scale. So what about local sponsorships? Often there’s a direct connection based on the product, as in this case of a man going for the Guinness record on ironing – note the Philips logos in the background. 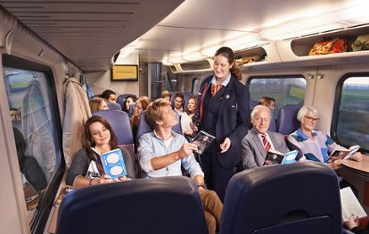 I spotted a local sponsorship recently that got me thinking; the National Railway (Nederlandse Spoorwegen, or NS) sponsors book week in partnership with the Society for the Promotion of Dutch Books (Stichting Collectieve Propaganda van het Nederlandse Boek). It’s a brilliant sponsorship, here’s why. At first trains might not seem to have much to do with books, but millions of people commute by train each day and many of them read. So the connection between taking a train and reading is already in people’s minds, and it’s already a habit. By sponsoring book week NS takes advantage of this existing habit. If you’re looking for a local sponsorship look for something that connects your brand to an existing habit. I understood the connection with one image of a passenger reading, it’s a very easy connection to make. If you can’t explain the connection in one sentence or with one image it might not be a real connection. If the story around your sponsorship feels forced, you might need to rewrite the story. There’s more detail (and examples) of sponsorship storytelling in this great article. The NS activation includes multiple events; book week, children’s book week and national book prizes. At each event there are multiple events, including free travel with a promoted book, an author signing her book on some trips, exchange of children’s book, and there is a book exchange room at the network’s biggest train station (although that station is being rebuilt – I hope the book exchange survives). The promoted book is one written specifically for book week, and seems to be a commissioned book – the author for next year’s book week (in March/April) is already known (article in Dutch). Look for ways to activate your sponsorship that get media coverage – in this case the national book prizes – and local interest – the free travel will appeal to Dutch (OK, I’m pushing the Dutch stereotype here!). The NS sponsorship is great, what more could they do? I didn’t see them activating on social media, and search today doesn’t find any evidence that they used social media to expand their impact, that may be limited by the lead organisation. activate to appeal to your audience, and use media and social media to promote your activities in a positive way. I’m planning to join “Boekenweek” next year, and take the train trip with the sponsored book. I’m still slow reading Dutch so I might need to go all the way to Maastricht.